Do you own a lot of jewelry and wish for a large and tidier place in which to store your necklaces, earrings and gems? 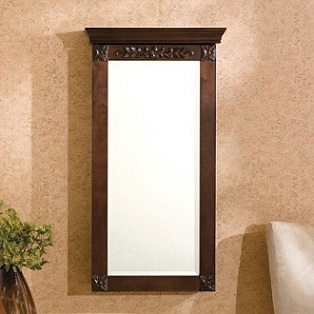 If so, this large ornate floor mirror with hidden jewelry storage will be just what you’re looking for. Classical stylish in appearance and highly functional in shape and form, this full-body length mirror with in-built storage is ideal for a wide variety of bedroom settings. The jewelry storage mirror is from the Seven Seas collection and as the name suggests, takes its design from the allure of the high seas from previous centuries. When first setting eyes on the large mirror with the enchanting carved border, one might be forgiven for thinking there is little more to the piece than meets the eyes. However, with a closer inspection one would find that behind the glass itself is safe and secure storage for all your previous jewelry. Two shelves as well as pouches and hooks for such items as rings and necklaces are present inside which contribute to the attractive Jewelry Armoire. The timeless piece, with its attention to detail and strong fittings which attach to the wall, will become an heirloom for any family and become a popular feature in the master bedroom. The felt lined storage inside adds extra protection for that special jewelry as well as an appealing way of presenting your collections without being mingled up together. All your pieces are visible! You can buy this exquisite piece here: Large Floor Mirror with Hidden Jewelry Storage.